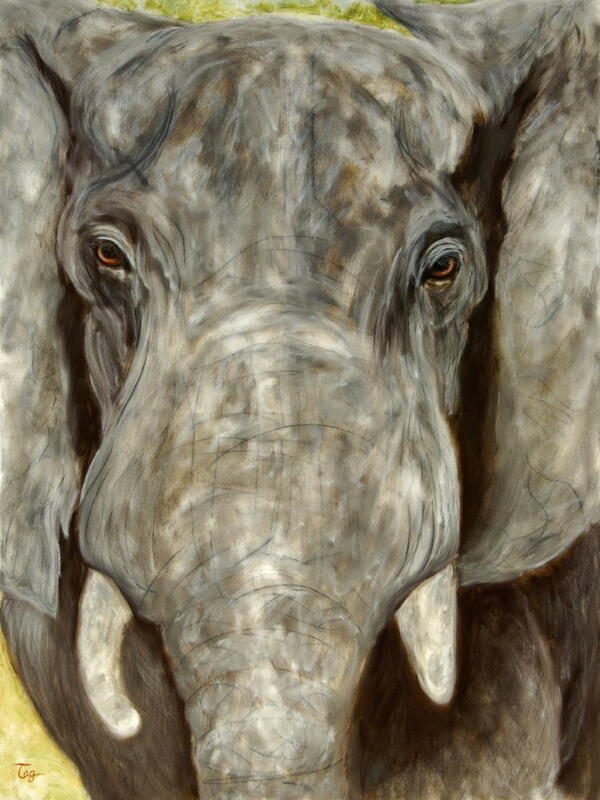 Just listed this HUGE elephant oil painting on Etsy, amongst other originals and prints. This painting is 30×40 and would make quite the statement in any decor! I also listed a ton of tile prints in my Etsy shop, and I’m having an inventory sale! Buy 2, get the 3rd for 50% off! Yep, that’s 3 tile prints for $20! They make fun affordable gifts for any animal and art lover on your list! Just be sure to convo me before you pay so I can adjust your invoice! 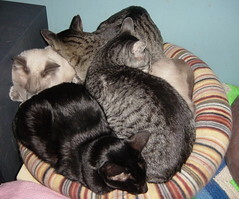 The cats are not pleased with the chilly weather here, time to clump! Another new painting on Etsy, an original oil, 10×10! 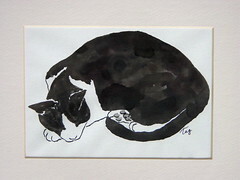 A new ink cat painting just listed on Etsy! This 5×7 is based on my cat Alma, she’s so sweet. This was a long tattoo sit. And, I had approved the design last week that Shayna had drawn up and we were going to start the outline. I was thinking it would be piece by piece, starting with the foo dog, but, Shayna was SO excited to do this piece, she had the entire arm pretty much mapped out. lol So, we started the stenciling. Amazingly, we got the foo dog stencil on in one try, which is so difficult to do wrapping something around one’s arm. Then the peony under my arm, and the kanji tag, smoke, and the cherry blossoms. Probably about 3.5 hours of continuous tattooing….but, we got the entire outline finished. I was pretty tired, and, Shayna had a blister on her thumb, lol. So, it’s a traditional foo dog, a symbol of protection. Closed mouth, which represents a female. Together with peonies, also symbols of protection. The red tag contains the kanji for “mother”, as this entire sleeve is a memorial to my mom. And the cherry blossoms which also symbolize the beauty and frailty of life. The smoke curls are lighter as they will be perhaps greyish, or, we may color them. 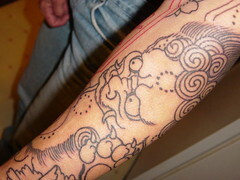 The foo dog will be black and grey shaded, with bluish eyes. The peonies will be bright blue (blue represents wisdom), cherry blossoms shades of pink. The background will be wind, also a traditional background for the foo dog, and, it fits in with the wind bars and hummingbird already on my shoulder. When you see foo dogs in pairs guarding temples, the male is typically on the right, and the female on the left. Also, foo dogs are actually depictions of lions, they are not dogs. So, I have a tiger on my right arm, a lion on my left. It’s not entirely known the origin of foo dogs, some think it came from stories heard about the Buddhist temple lion guardians, others think it comes from an early Japanese Shinto religion that had a lion protector, and the early artists used dogs as models for they had no idea what lions looked like. This feels so right, I feel like I’ve been waiting for this tattoo for a long time. It’s for you mom. Moss Rock Festival this weekend! This afternoon my husband and I drove down to Birmingham AL to set up my displays for the Moss Rock Festival mossrockfestival.com/ that takes place Saturday and Sunday. It’s a really fun arts festival, I have done it 2 years previously, and for a new venue, it’s quite impressive! Lots of fabulous artists, and organized so well! I can’t say that enough! It also looks to be a wonderful weekend weather-wise, so, if you are in the Birmingham Alabama area, stop on by! I have a few new paintings to show as well….a new figure painting which I will picture below, and, a brand-spankin new HUGE elephant painting that, well, I can’t show as I haven’t photographed it yet! But, I’ll take some pictures tomorrow at the art fest. Here’s my new figure painting…..hopefully part of a new series, I enjoyed doing this one. 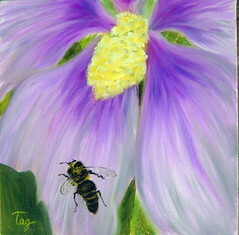 You are currently browsing the TagsCats Art Weblog blog archives for November, 2008.